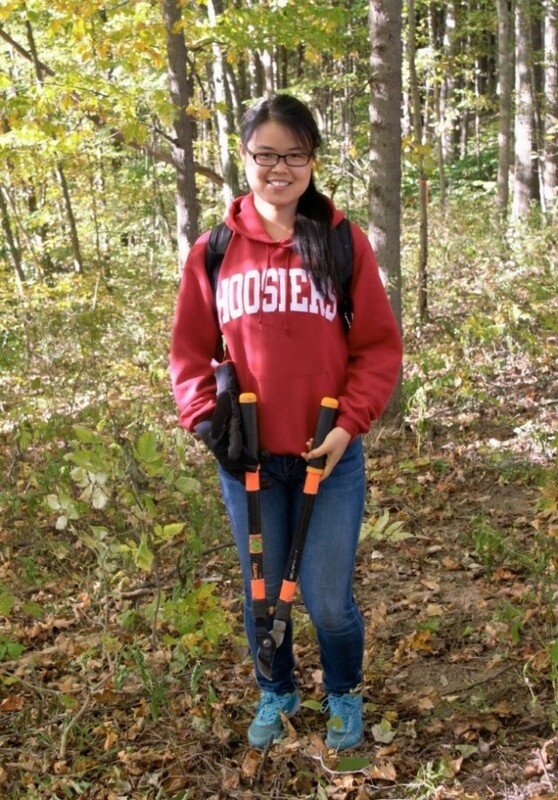 Jie Yan loves the woods so was happy to help clear a trail at Porter West Preserve. Photo by Jaime Sweany. I am from northern China. My hometown Langfang is a small city in Hebei Province, only a 45 minute drive to Beijing. When I was still in China, I noticed that as one of the rapidly developing countries, China was facing many pressing issues, such as environmental pollution, domestic violence, and child trafficking. The air quality in Beijing is becoming worse and worse. The whole city is blanketed by smog for most of the days in winter. The sky is always grey instead of blue. People want change, but the problem is that we depend on the government heavily to make improvements. Non-profit organizations are under-developed in China and a growing number of people are starting to realize this. So I think non-profit management holds promise for China’s future. I came to IU because SPEA has such a successful program, and as expected, I gained precious experience with two and a half years’ of learning while in America. 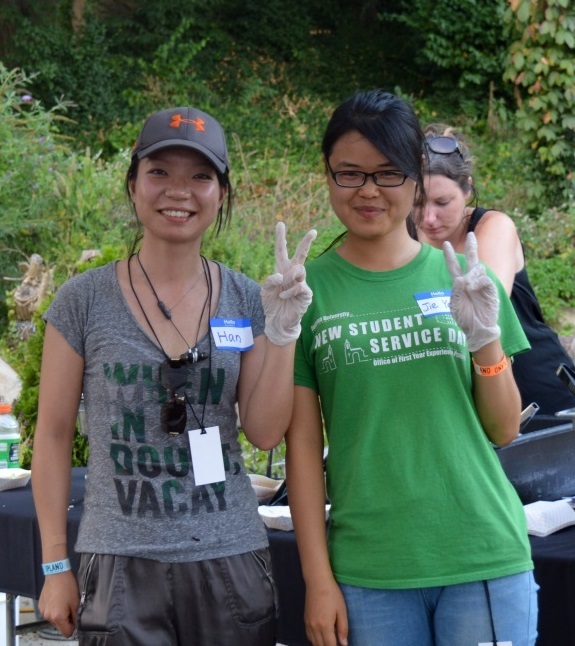 Jie Yan (right) was introduced to Sycamore by her friend Han, both of whom love nature and giving back. In September, they volunteered at Hillbilly Haiku Music Festival. Photo by Jaime Sweany. I heard about Sycamore Land Trust from my friend Han, who is also a nature-lover. We like sitting in the sunshine, hiking in woods, and riding bikes with trees alongside the roads. So when she told me that there was this great opportunity to volunteer in an organization aimed at protecting nature, I was very excited. After I visited Sycamore’s headquarters, Cedar Crest, I fell in love with this beautiful place. It sits in woods with squirrels and chipmunks running around, which is a dream working environment for me. Also, staff and volunteers in Sycamore are nice and enthusiastic. We hiked in the woods to rebuild trails and I helped prepare for the 25th anniversary Annual Celebration fundraising event. Thanks to various events, I am getting familiar with how non-profits operate. Like President Obama once said: “It’s our responsibility to protect these treasures for future generations, just as previous generations protected them for us.” I will keep working for the environment, devoting myself to the promotion of protecting our earth, and helping to develop non-profit organizations in China for a better future. 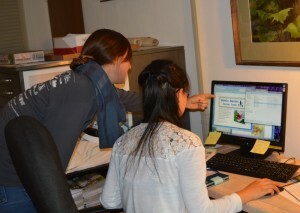 SPEA Fellow Anna Archer and volunteer Jie Yan work on materials for Annual Celebration. Photo by Jaime Sweany. 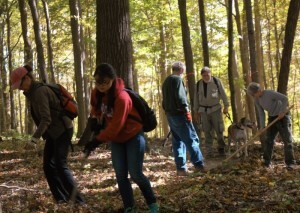 Jie works with other Preserve-A-Preserve Day volunteers clear a trail at Porter West Preserve, October 2015. Photo by Jaime Sweany. Jie will be moving home to China on December 9. We appreciate her many hours of volunteerism on behalf of Sycamore Land Trust. We wish her much success with her environmental work back in her homeland. Thank you, and good luck Jie Yan!